Join Ananda Expeditions for a 6-night/7-day yoga + adventure retreat that comprises daily Vinyasa yoga practices with Martin Scott, adventurous hiking and sightseeing excursions led by Michael Hoyer and local guides, and meditation and Yoga Nidra sessions. Our home base in Western Ireland offers comfortable lodging in beautifully-renovated 19th-century farm buildings and delicious vegetarian meals of seasonal, organic produce. The yoga studio perches on the edge of the achingly-green Irish countryside; its glass wall looks straight out onto the Atlantic. During the week, we'll practice daily, walk the length of the stunning Cliffs of Moher, explore the wild landscape of the Burren with a local guide, enjoy a traditional music session in a pub in Doolin, and take a day-trip by ferry to Inis Oírr and cruise back along the Cliffs of Moher. 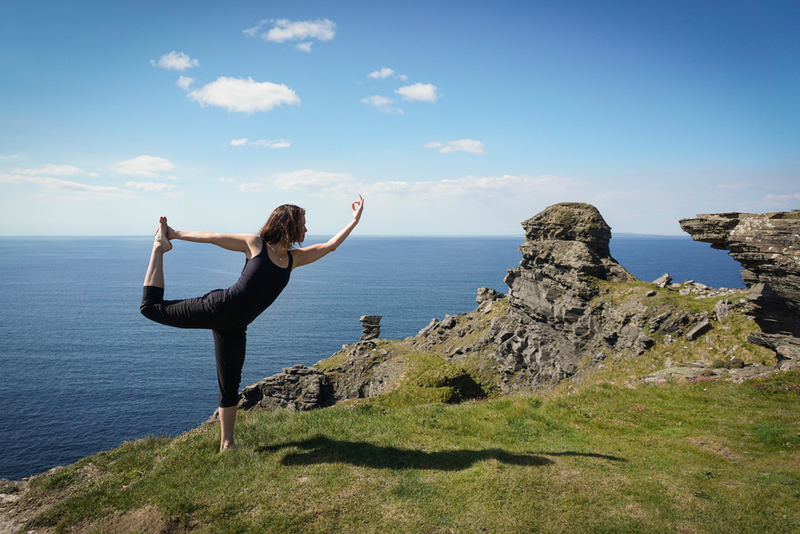 In addition, you can swim in the Atlantic, explore the area by bike, take a surf lesson in Lahinch, and/or schedule massage treatments on-site. This is your chance to take your practice abroad and treat yourself to the vacation you've been craving! Depart your home airport for the overnight flight to Ireland. Arrive into Dublin Airport, by approx. 10:30 AM, and meet up with the group to transfer to the West Coast by private coach. Settle into your room at the retreat center and unwind with a grounding yoga practice with Martin. Enjoy your first vegetarian meal of organic produce before retiring for a good night's sleep. 10:00 AM — Guided Walk / Ferry Trip / Etc. The morning will follow the "Variant 2" schedule, culminating in a final, farewell lunch at the retreat center. You'll have time to finish packing up after lunch, and we'll check-out by 2 PM. You'll opt to join the Add-On Itinerary, detailed below. Travel south to Killarney, a small, lively town that borders Killarney National Park. Settle into the family-run hotel where we'll spend two nights before heading out for dinner at one of the recommended area restaurants. Retire early or stay out to enjoy a live music session at a local pub. After breakfast, we'll drive the scenic Ring of Kerry, stopping to admire the Kerry Cliffs and gaze out at the Skellig Islands. Circling the peninsula, we'll get dinner in Kenmare, an up-and-coming foodie town. Take in still more incredible scenery as we cross Killarney National Park on the home stretch back to Killarney. After an awesome breakfast, we'll make our way around the Dingle Peninsula — guided, in part, by a well-respected local historian and naturalist. Transfer up to Shannon to spend our final night in a hotel near the Shannon Airport. Whenever you need to, hop the hotel shuttle for the 10-minute ride to Shannon Airport. So, I need to book accommodation in Dublin for the night of Friday 9/9? Yes — if you’re not joining us on the Add-On Itinerary, you will need to book accommodation in Dublin for the last night of the trip. I recommend staying near St. Stephen’s Green, which is where the private coach will deliver you by about 6 PM on Friday evening. Also, if you choose the option of Air Coach to travel to the airport Saturday morning (€8.50 per person; 40-45 minutes), it picks up on the north side of the green. I have reserved a few rooms at a couple hotels near the green for signing over to participants on a first come, first served basis. Can I rent a car and drive myself to the retreat center? Of course! Keep in mind two things before deciding: 1) one drives on the left-hand side of the road in Ireland, as in the UK; the driver sits on the right-hand side of the car, and shifts with his/her left hand, and 2) gas is significantly more expensive than what we Americans are used to; expect to pay €1.10-15 per liter. Can my non-yoga-practicing partner/friend come along? Yes! The great thing about the yoga + adventure structure, is that it allows yogis and non-yogis alike to enjoy a unique travel experience together — one on which the yogi can still practice regularly. Depending on availability, we might be able to offer a non-yoga-practicing participant a discount; please inquire! Irish weather, particularly in the West, is notoriously changeable and generally on the wetter side. This means that, although September is typically the driest, sunniest month, we best be prepared for some rain. Yes — in a common area, but not in the individual rooms.